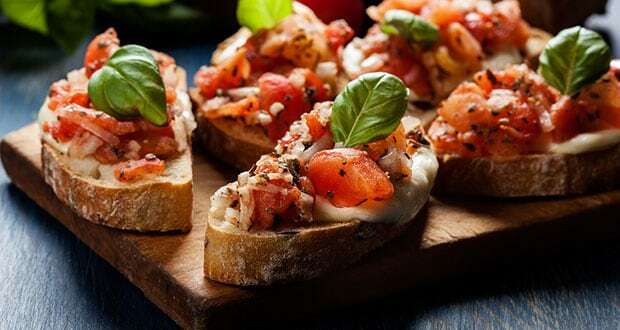 About Vegetable Bruschetta Recipe: An Italian delight, this bruschetta recipe is a treat to have during the monsoons. A perfect snack recipe, vegetable bruschetta is loaded with delicious olive paste, mouth watering amount of parmesan and mozzarella cheese along with tomato confit and basil. Your mid day meal or a tea time treat couldn't get any better! 1.Spread olive paste on all three pieces of breads evenly. 2.On the first slice arrange grilled artichoke hearts garnish with parmesan. 3.On the second slice arrange tomato confit & mozzarella with garlic, onion & basil. 4.On the third slice arrange goat cheese, minted grilled zucchini and garnish with mint leaf. I made this for a bridal shower ,and it was a hit. I served this at a dinner party last night and everyone loved it ! I made this exactly as written and it was perfect !